Over the past decade we have witnessed a dramatic rise in bed bug infestation in Chicago and across the state of Illinois. Such infestations have resulted in tens of thousands of injuries including severe allergic reactions and scarring, resulting in expensive medical costs for victims. What’s more many victims have to suffer the embarrassment of having their residence and belongings contaminated with bed bugs. Our law firm and our associate attorneys are dedicated to the pursuit of justice on behalf of individuals who have suffered harm due to bed bug bites and infestations in Chicago and across the state of Illinois. If you have any further questions regarding injuries that you suffered due to a bed bug bite incident feel free to contact our law office. We sue hotels, motels, landlord, and property managers whenever someone suffers injuries due to bed bugs. No matter if the injury is minor or major, contact us to see if our law firm can sue the responsible parties for your damages. All consultations and case reviews are provided by our attorneys free of charge so if you would like a bed bug attorney in Illinois to fight and get the justice that you deserve, contact us today for a free case review. There are several important steps that you should follow in order to protect your legal right to recovery following a bed bug incident at a hotel, resort of motel. Take pictures of the bed bug bites and the actual bed bugs. Try your best to find where the bed bugs are. There is likely a nest of bed bugs located somewhere in the room. File an incident report with the hotel. Ask them for a copy of the report. Seek medical attention for your bug bites. Do not sign any releases in return for cash or free hotel stays. Once you sign a release you will no longer have a right to seek recovery via legal means. Make sure you do not infest your residence: Place all your clothes that were in the hotel in a closed and sealed plastic bag. Do not bring them to your home. Contact a bed bug injury attorney immediately regarding your injuries and your right to recovery. Over the past two decades bed bugs have spread like wildfire across the country. Today bed bug infestations can be found in many different locations. Property owners, store and hotel managers have a duty to maintain a safe and clean environment for customers which includes routine inspection of their property for bed bugs and other harmful vermin. Below is a list of the most common locations where bed bug infestations can take place. Hotels, motels and hostels: The price or star rating of a hotel room may not be an indicator of the presence of bed bugs. Bed bug infestations can take place in five star hotels as well as low costs motels. Used, second hand furniture stores and rent-to-own stores, selling mattresses, sofas, chairs and couches infested with bed bugs. Apartment buildings – especially low income housing units. Thrift stores and used clothing stores. Movie theaters: Seats in movie theaters need to be routinely inspected by the staff in order to discover bed bugs. Medical facilities – including hospitals, treatment centers, chiropractor offices, and emergency rooms. Public and private transportation: Uber and Lyft vehicles, taxicabs, buses and trains. Schools: Public elementary and high schools, colleges and universities. Health clubs, gyms and spa facilities. In the state of Illinois victims of personal injury including bed but bites and serious infestations are entitled to recovery for all damages and harms suffered. One of the most common questions from our clients concerns the level of compensation available for victims of bed bug bites. The potential recovery for a bed bug infestation claim is bases on many factors unique to every case. Below is a list and brief explanation of the most important factors that can determine the potential value of your bed bug injury case. The extent of the bug bites suffered by the victim. The amount of needed medical care and future healthcare costs associated with the bites suffered. Damages or destroyed property as a result of the bed bug infestation: In many cases bed bugs can infiltrate your clothes, furniture, bed or other belongings. Victims are entitled to compensation for any damage to or destruction of their personal belongings due to a bed bug infestation caused by a negligent or wrongful party. The level of pain and suffering: Under Illinois personal injury laws victims of harm have a right to receive compensation for their daily physical pain and mental anguish resulting from bed bug bites. Often the psychological damage associated with bed bug bites is overlooked. In reality many victims will suffer from prolonged periods of PTSD, anxiety, sleeping disorders, and depression. Whether punitive damages are recoverable in your case: Under the common laws system of jurisprudence courts may award punitive damages to a victim when the at fault party acted either intentionally to cause harm or acted with reckless wanton disregard for the life and health of others. Examples where punitive damages have been awarded are when hotels, used furniture stores or apartment building managers knew of the presence of bed bugs but failed to either remediate the issue or properly warn customers, tenants and guests. The statute of limitations is the time period an individual claimant has to file a civil lawsuit in the court of law. In the state of Illinois victims of personal injury including bed bug bites typically have two years from the date of their injury to file a civil lawsuit. Minors, individuals under the age of 18 generally have two years from their 18th birthday to file a personal injury lawsuit in the state. Many individual who are terrorized by bed bug infestations in Chicago are visitors to the city and state. Under the common law system of jurisprudence the case has to be filed in the jurisdiction where the incident resulting in the injury took place. Thus the two years statute of limitations of the state of Illinois would apply. Our law firm and associated attorneys provide experienced legal representation on behalf of bed bug victims strictly on contingency fee basis. This means that our clients will never have to pay any out of pocket fees and costs until their cases is successfully resolved. Additionally if there is no successful resolution of your case you will not have to pay us back for any of our legal fees and costs associated with your case. If you live in Chicago or surrounding areas, our bed bug lawyer in Chicago will be happy to meet you and discuss your case. If you are anywhere else in the State of Illinois or even if you are outside of Illinois, we may still be able to help you depending on the details of your case. Please contact us. 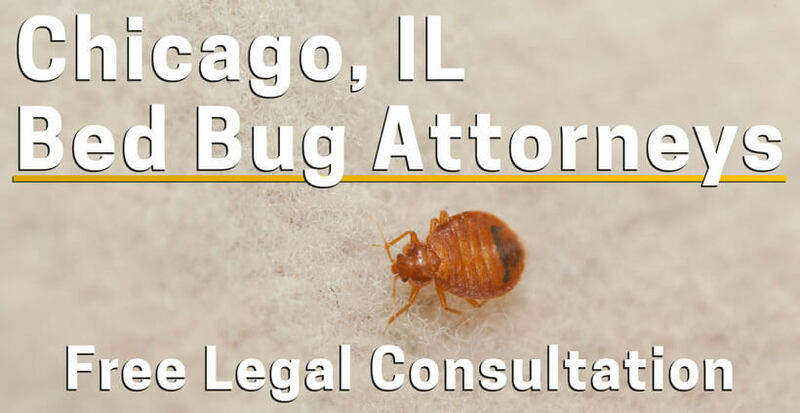 Our Illinois bed bug attorneys are able to provide free no costs legal consultations and case reviews for all victims of bed bug bites in the state of Illinois. If you have any questions about your case or if you would like our bed bug attorney to review your case, please contact us.